This year I’m flying in to AirVenture 2013, for the first time as a PIC. With me will be another person from CloudAhoy, Etan Rozin. We would like to meet as many CloudAhoy users as possible! 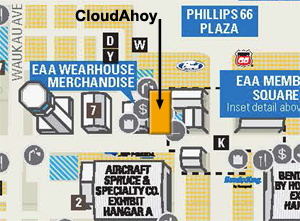 Where: International Marketplace South food court, K-12 on the map, located between the tower and the EAA Member Square. Etan and I will be wearing CloudAhoy t-shirts with our cool new logo. What cool new logo? Stay tuned. Drop me an email (chuck@CloudAhoy.com) if you’re coming.